I’m a mom to two cunning and adventurous boys, aged almost four and two, and even though I’ve been in the parent role for almost four years, I feel like I’m still fairly new to the family tradition-starting game. I don’t even want to get into my response to my toddler pointing out that Santa did indeed look a lot like Grandpa; I will forever remember not having a clever response to his shocking observation. Therefore, for Easter, I wanted to be on my game, so I asked around my mom-circle of friends for some crafty new-age and old-family Easter traditions. Here were a few egg-tastic ideas I came across! Many families, including mine, put together big baskets of goodies and toys for their children. It’s a real treat to follow the trail of Easter eggs to the treasure basket at the end, right? Well for this tradition, instead of using that plastic grass or green paper shreddings for the bottom, it’s a neat idea to grow the grass yourself ahead of time – with your kids! My family purchased wheatgrass from the farmer’s market and are currently taking turns watering it until the big day. I explained to my boys that the Easter Bunny needs to have a place to leave his gifts to us, so we need to grow some grass for him to hide our presents. They really like helping me take care of it; it gives them some responsibility and excites them quite a bit. It’s also cheaper than the plastic grass and will go nicely in our smoothies afterwards. Plus, it won’t end up all over my floor or in the landfill. This was the cutest tradition I’d ever heard of and I can’t wait to do it with my family! The evening before the Easter Bunny arrives, my family and I will be planting jellybeans in our garden. Yes, that is correct! We will be digging holes in the soil, putting candy jellybeans inside, burying and watering them. The next morning (with a little help from Mom), the jellybeans will have sprouted into large, muti-coloured lollipops (or peeps on sticks, I haven’t decided yet)! This will be the sweetest tradition because any lollipop-shaped treats are my children’s favourite candy and I know I will be catching amazing memories on camera! One of my mom friends told me she takes her kids to a farm once or twice around the Easter holidays. This really makes me think of spring because you’re bound to see bounding lambs, chirping chicks, and porky piglets. I think this is a great idea for a spring outing and is sure to teach young ones about outdoor farm activities. If you’re interested in making this a tradition, I recommend Prairie Gardens just north of Edmonton. They are opening a little later this year than normal (May 1st) but they always have great farm activities, including a petting zoo, and festivals (click here)! Lots of families do the chocolate and toy scavenger hunts, even personalized ones or ones with riddles and clues! I love the idea of all of them as my parents also did these for us while growing up, but have you ever heard of an Easter egg scavenger hunt at night!? When my tots are a little older, I will certainly be bringing the fun with this game! 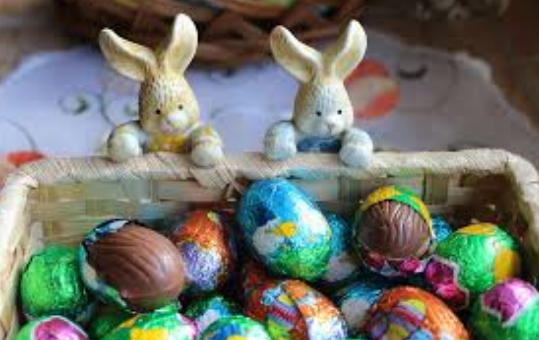 What you do is get the plastic Easter egg containers, the chocolate eggs or toys, and glow-in-the-dark bracelets – crack the bracelets, add them and the chocolate to the Easter egg containers, turn off all the lights and hide them. I’m certain no child will forget this cool and spooky Easter tradition (beware of terri-fried little chickens)! Again, many people probably recall the lovely family brunch they grew accustomed to on Easter morning, cracking open and enjoying numerous coloured eggs (after handfuls of chocolate I’m sure). But a few Mom friends of mine have brought the Easter egg coloured breakfast one step further – rainbow pancakes! Just separate your favourite pancake batter into different bowls and add food colouring. Watch the happy faces enjoy their rainbow stack of pancakes with their favorite juice (which you can also add colour to)! This one is also really cute – instead of using plates for our Easter picnic at the park, we will be eating out of egg cartons! And I have so many cartons saved up already, it won’t be hard at all. Cut up some cheese, broccoli, carrots celery, nuts, raisins (all of the Easter Bunny’s favourites of course) and add them to their own egg compartment for a portable lunch outdoors! Of course, one of the egg compartments will have chocolate eggs; I’m not a total Momster. If your kids are old enough to read, they’ll either love it or be disgusted – if this joke is a bad egg, don’t blame me, I only laid the table! If you have Easter traditions you’d like to share, please feel free to leave a comment or story! I know we’re all funny-side-up yolkers here! Have you ever found yourself enjoying a nice cup of tea and watching the morning news in peace when suddenly a pint-sized person jumps from the arm of the couch into your unsuspecting face? Children love risky play, especially my children. They are constantly looking for ways to increase the thrill of the game, even if it means sacrificing safety. The purpose (other than to give me a heart attack) is to increase the fun and explore the rules of their environment. Risky play is a learning technique – what I mean by this is that when children are engaging in risky play, they are conducting a science experiment (without knowing it). They are using reasoning and chance, as scary as it is, to determine what they are comfortable with, and what their bodies and environment will allow. Risk management skills, along with self-confidence, resilience, and reducing the chance of injury, are all learnings a child gains from engaging in risky play. I know what you are about to ask; how can risky play reduce the chance of injury? The science tells us that those children who engage is risky play have a much greater understanding of what is likely to cause injury. A child that has continually experimented with tree climbing knows the best routes to take, which trees are safe to climb, and how to go back the way they came. If you had never climbed a tree as a small child and then are asked to climb one as an adult, your body, being longer and stronger, would allow you to climb to the top without difficulty. But now you’re in a pickle because you’re at the top of a tree and don’t know how to get down. A child can only climb as high as his or her body and environment allows, not to the top. They take small steps as they mature, pushing themselves just as much as is allowable. Risky play certainly seems dangerous and it can result in injury, so why hasn’t natural selection weeded it out? Experiments have been done on rats to deprive them of risky play and the outcome was less than appealing. The researchers did not deprive them of other types of socializing, just risky play, and they found that the rats grew up emotionally crippled. When faced with the unknown, instead of showing curiosity and adaptability like their risky play counterparts, the emotionally crippled rats would seize up in fear or lash out with aggression (click here). Not a rat-ical way to grow up. 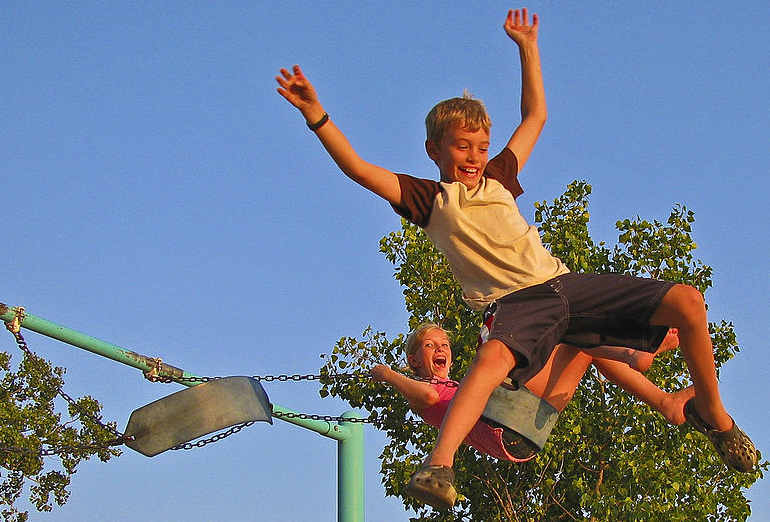 On the flipside, the science has shown that risky play has quite the evolutionary advantage. I’m sure everyone can recall their puppy or kitten play wrestling with them or another animal. Perhaps to wolf cubs, this is practice for later squabbles over meals. Monkeys will leap for branches that are just within reach, pushing themselves further and further each time. This experience will certainly come in handy when leaping away from challengers. Certainly one of the most perilous types of risky play can be seen in mountain goats (kids) that frolic on incredibly steep, rocky slopes. Undoubtedly this will make them hard prey to catch. All animals engage in risky play and it benefits them tremendously. So now that we are all aware that risky play is a benefitting activity to engage in, should we just let our youngsters have at it – absolutely not. There are still real dangers in hazardous play (which often accompanies risky play), so parents have to be vigilant in identifying and removing the hazards. Hazards are often beyond a child’s ability to recognize. Risks are uncertainties that a child often recognizes and challenges (click here). Back to our lovely tree example, the child sees a challenge and is uncertain about what will happen if they climb to a certain branch. What the child does not recognize is that the branch they’ve chosen to climb to has rotted out – a hazard the parent needs to control. Removing the hazard can be done by removing the branch, or, even better, teaching the child how to recognize rotted branches. By controlling the hazards, the child is still able to engage in risky play without an increase in the chance of injury. Risk now equals hazards divided by parental safeguards. Living in a city rather than countryside can seem a little challenging when it comes to engaging in risky play, but it’s important to note that risky play hotspots can be found anywhere! Your local park, your backyard, your living room – anywhere! When it was too cold and slippery outside for hazardless risky play, my family and I set up an obstacle course throughout the house. My preschooler would run and jump from chair to chair and my toddler would bound into piles of pillows. When we play in the backyard, my kids love to use the short beam surrounding my yard to perfect their gymnastic skills. The chance of a small drop to the grassy lawn below certainly livens up the game! And local parks encourage plenty of risky play activities with its monkey bars, twisty slides, and swings. 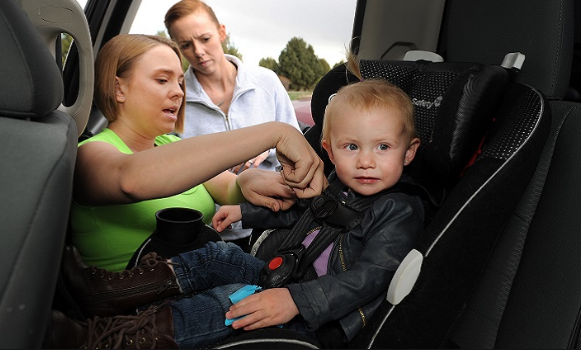 All you have to do to be a vigilant parent in these scenarios is to remove debris, check for the correct signage for safety standards, and be a helping hand when your child needs it! To find out more on how Canada is improving your child’s access to independent and unstructured outdoor play, click here. Please feel free to leave a comment or story about the risks you and your child take together! Coming out of the winter coma are the bright and fresh faces that perk up in the new light of spring! If your kids are like mine, just coming to terms that Mom was right, that the world really does have seasons, you would also laugh at their astonished faces as you push them into the year’s first muddy puddle! And now that my spring babies are another year older, what does it mean for new activities this year? Of course I had this planned since they started walking – sports! Every parent loves watching their child grow and master new skills. For preschoolers playing sports, these skills can include better coordination, increased stamina, healthier lungs and hearts, stress reduction and improved sportsmanship. For the family as a whole, it promotes bonding and healthy living! A home run for everyone! For our family, sports can be a huge undertaking. They can be pretty expensive as they usually require gear in addition to registration fees. They are usually held on weeknights, which can be exhausting. Plus, there are so many kinds to choose from – a hurdle on its own! But these red flags shouldn’t hold you back! After all, raising children is a lot like building a recreation centre. The first five years can be likened to laying the foundation, the most crucial part as it sets the pretense for the rest of the structure. A strong foundation with core morals and values will enable your child to grow into a beautiful building, I mean person. And sports have the power to help build that strong foundation because they teach leadership, trust, patience, discipline, respect, and sportsmanship! There are a few organizations out there that can help low income families pay registration fees and/or provide funding for equipment. One of these programs is called KidSport, a local non-profit whose mission is to allow any kid to benefit from sports and to remove the financial barrier that could be preventing them. To check out their website, click here. Likewise, Canadian Tire’s Jumpstart program is very similar. The criteria to qualify are similar and they are happy to help families fill out application forms. Find them here. Also, your local YMCA has funding options for low income families and they host a huge variety of programs! For qualification, check them out here. Lastly, this hidden gem is not so hidden. AllSports Replay is a used sports store where you can buy and sell secondhand sports gear! This is a great way to save a buck and also give your old sports equipment a new home. Find them here. As for knowing which sports your child is ready for… Were you or have you ever been like me – new to the world of sports but wanted to drive that soccer-mom minivan with an air of expertise? I’m happy to say I’ve now lived through an entire season of kids in sports and know a thing or two! Check out these sports and their corresponding benefits! 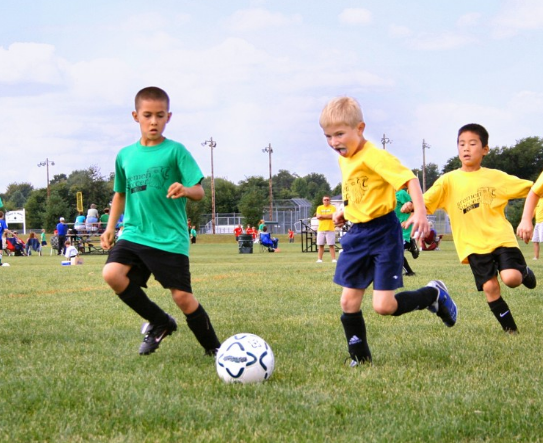 Soccer – One of the more popular sports for kids. It’s easy to learn, with young stars starting out at the tender age of two, and one of the more reasonably priced ones (I recently paid $115 per child for the spring season and no gear was required). Soccer is fast-paced, adrenaline pumping, and promotes teamwork and discipline. As children age, they will also have the benefit of learning to control and juggle the ball, improving coordination and flexibility (click here). Badminton – Racket ball sports like badminton have additional benefits because they encompass a large variety of athletic movements, including running, lunging, swerving, and diving. Small children can easily hold and handle small badminton rackets and learn to handle the birdie with practice and patience. When older, sports like badminton encourage kids to become nimble and strategize their moves. To learn from the experts on gear and game, click here. Swimming – A must-learn survival skill and wonderful pastime, swimming is a sport that is learned through competition with no one but the water. Once learned, swimming will never be forgotten, and strangely enough, no one is a newbie as swimming is actually learned in the womb. My babies and I did Mommy muscle toning swim classes together when they were only four months old! Classes were $75 and only required swim diapers! See here. Lacrosse – Another sport that is knocking it out of the park is lacrosse! A great starter game for hockey enthusiastic parents that cherish their children’s front teeth, lacrosse is a strategic game that requires dexterity and quick-footedness. Starting at four years, my older son has just come out of his first season of lacrosse and has learned quite a bit about teamwork. The season wasn’t too expensive ($120 for three months) but the gear was quite pricey. Still, if you dream of cheering on your little star, check out the specs on proper hockey helmets as I believe this is the most important part of this sport (here). Bicycling – This is one sport I love to do with my kids and it is terrific for cardiovascular exercise! It promotes balance, coordination, and love for the outdoors! You can pick up fairly inexpensive balance bikes or training wheel bikes at Sportchek ($60) or buy secondhand, or likewise, baby ride-along seats that fit on your bicycle ($100)! For the experts in bicycle and helmet reviews for kids, check out two wheeling tots here! Child Too Young for Sports? Is your child too young to pass a ball but you’re itching to get back into the active world of sports? Were you previously an active person and find it hard to get back into the swing of things after being dubbed the parent title? I recall a time when I could go running or swimming any time I wanted – Now I have to get creative! The jogging stroller – try picking up one of these! They can run fairly prices but if you have Kijiji at your fingertips, you can usually score a good deal as many parents love them and they usually last through more than one child. Likewise, Once Upon a Child usually has discounted secondhand ones that you can testdrive in the store. Jogging strollers are very useful and maneuverable. They double as a mode of transportation and as running equipment (especially if you find one with snow runners). Plus, running is a free sport! If running isn’t your thing and you crave the atmosphere of the gym or class, check out the City of Edmonton’s Kids Dens located in these rec centres: Clareview, The Meadows, Commonwealth, Terwillegar, and Kinsmen. They have childminding staff that will watch your little one while you work on your bod for one to two hours. If you’re interested, click here. Now that you have the knowledge, it’s time to get active! Remember, building a strong foundation with your child now will help them out in years to come! They need a strong foundation to rely on for their entire lives – let sports help you impart knowledge and values to your kids now – you won’t regret the effort! Do you have one or more picky eaters at home? Do you struggle with kids who like candy too much? Do you like providing your munchkins with healthy dessert options? Are you a parent with limited meal prep time? If you answer yes to any of the above questions, I recommend giving this blog a good read, because I’ve compiled some of the best dessert recipes and info on healthy dining that I’ve come across over my last few years of being a Mom! Good food provides our children with nutrients and energy. Nutrients, both macro and micronutrients, support the reactions cells have in our bodies and provide us with energy. Energy allows our bodies to function. The two together make for one healthy individual. Macronutrients are the calories needed for energy. The term “burning calories” is very real as our bodies live off of this “fuel.” Macronutrients come in the form of fats, carbohydrates, and proteins. Most foods contain high amounts of these macronutrients, so I won’t dive too deep into their importance. Micronutrients are composed of vitamins and minerals. We need a smaller amount of micronutrients than macronutrients, but they are still essential to healthy living as they help support our cells in their ability to regenerate. Cells make up our entire being, organs and all. Click here to learn more! So children, with organs and tissues still developing, and more energy than we can sometimes handle, need the perfect mix of these vitamins, minerals, and fuel. As a Mom with children who live for chocolate‑themed holidays, how do I put the health back into our desserts? A little help from our new Canada Food Guide has given me some clues. You may have noticed that the new Canada Food Guide has done away with portion sizes and redirected its information towards the importance of certain foods. This is a wonderful adoption as no person is the same and we don’t all require the same amount of food. Children going through growth spurts eat a lot, as do athletes, as they are really active. Vegetables are a mix and match when it comes to what they provide us. Starchy vegetables, like corn and potatoes, have carbohydrates and vitamins. Dark green veggies pack plenty of protein and minerals. Fruit contains a perfect blend of carbohydrates, vitamins (like Vitamin C and Vitamin B-9 (folate)), and minerals (like potassium). They also have plenty of fiber, which is indigestible, helping to clear our bodies of waste. According to the Canada Food Guide, healthy living suggests half of our diets should consist of vegetables and fruit. Protein foods, such as plant-based foods, provide vitamins and minerals in addition to proteins. Plant-based protein food, like nuts, seeds, beans, peas, and lentils, provide more fiber and less saturated fats. Try to choose these types over animal-based ones. According to the Canada Food Guide, healthy living suggests one quarter of our diets should consist of protein foods. Known for their high-fiber content, whole grain foods, such as quinoa, pasta, rice, and oatmeal, also provide us with vitamins and minerals. Foods with high-fiber content help rid our bodies of waste, preventing diseases associated with digestion. Fiber also helps slow the rate that sugar is absorbed, helping regulate our sugar levels. According to the Canada Food Guide, healthy living suggests one quarter of our diets should consist of whole grain foods. So it’s clear that vitamins, minerals, and fiber are just as important as those high fuel foods we enjoy so much! How do we get them into desserts that usually don’t include them? Luckily, I have a few recipes up my sleeve that are packed with these micronutrients and still taste delicious! Yes, you read that right. 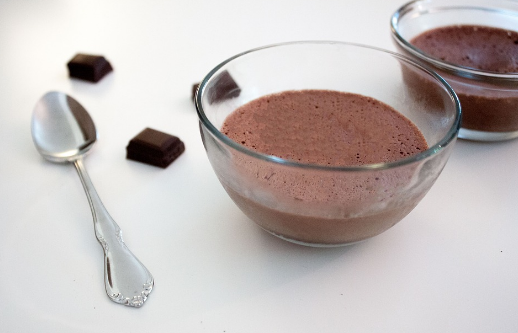 I have a very fast, very healthy chocolate pudding recipe that my kids (and I) love! Mix the almond milk and chia seeds together with a 1:1 ratio in the container. Place the lid on and shake vigorously. Place the pudding in the fridge for 24 hours. Serve cold. Apart from it’s wonderful nutty flavor, almond milk also has Vitamin D and calcium added to it, just like regular milk (both are enriched, meaning we added it after pasteurization). Almond milk has less proteins and carbs than cow’s milk but more Vitamin E. Chia seeds have a lot of everything, including fiber, protein, nutrients, minerals, and even antioxidants. What is particularly impressive about them, however, is their ability to bind to toxins and carry them out of our bodies! Get ready for this one, it’s a no-bake cookie recipe! Blend everything together in your food processor and scoop out with a spoon. Roll 1 to 2 inch balls with your hands and place in the fridge. FYI – my younger son loves these as is, but my older one typically won’t eat them unless there’s mini M&M’s in them. You win some, you lose some. Place in the fridge and serve cold. Dates are packed with fiber. For anyone that has eaten too many of these at one time, you don’t need me to go into details. Coconut butter though, this one is worth explaining. It’s packed with healthy fats that provide us with clean fuel, but it also has lauric acid (which is a really powerful antibiotic if you didn’t catch my breastmilk blog), one of the very few foods that do. Purchasing tip: Coconut butter runs at high prices in grocery stores since its health benefits hit the newspapers, but it is still very reasonably priced at Asian food markets. This one is an old family secret, although many families seem to have co-authored it online, which must mean it’s a good one! It takes a bit longer but has little actual work time. Preheat your oven to 350°F. Cut the squash in half and scoop out the seeds. Place both halves face down on the baking sheet and bake for 1 hour. Once baked, it should be tender enough for a fork to pass through, like butter. Turn the halves over, face up, and add the brown sugar and butter to one of the halves. Put the two halves together (place one on top of the other) and put them back in the oven for 20 minutes. Remove them from the oven, peel off the skins, and blend with a fork or blender. Serve warm. Squash is the healthy ingredient here, so I will elaborate on it. It packs vitamins, folate, minerals, and fiber! The mineral manganese, which it is rich in, helps boost bone strength and your body’s ability to process carbohydrates and fats (which is good since these are this custard’s other ingredients)! Added bonus: acorn squash seeds are just like pumpkin seeds! Roast them up in your already preheated oven with some salt and you have a fiber-y snack for the next day! I always buy too many bananas. We used to do our best to buy the right amount, but their brown, spotted bodies always seemed to stare me down at the end of each week. I had to come up with an alternative to watching them deteriorate. Luckily, this recipe came to the rescue and no ice cream maker was required! Cut up your bananas into slices and lay them on your parchment papered tray. Put them in the freezer until frozen, about 2 hours. Pulverize them in your blender a few times, using a spoon to scrape the sides when needed. Once a creamy texture, add the peanut butter and blend one more time. Serve cold. Peanut butter is a plant-based protein food, containing mono-unsaturated fats. This means they are easily digestible and give you healthy, clean fuel. It’s also very rich in vitamins and minerals. Bananas are a powerhouse when it comes to nutrients. They are packed with vitamins and minerals, most famously, potassium, which helps regulate muscle control like your breathing and heartbeat. Their also easy to digest since their rich in fiber. The combo is simply delicious – and no more spotty bananas! If you like these healthy, low cost recipes, I know you’ll enjoy KARA’s Collective Kitchen program, which also packs in the nutritional information and easy how-to creations! Call KARA to register for this one as soon as possible because it can fill up quick! As the weather turns, it’s difficult to keep our kids active and inspired. Rather than turning to the same old toys and television, I urge parents to try some indoor crafts! And, there’s no better time like the present because there’s another fun holiday around the corner, and terribly low temperatures leading up to it. Knowing this, my sons and I have been working extra hard on decorating our home with DIY Valentine’s Day crafts! Craft making is inspirational! Not only does it help young ones develop fine-motor skills and give them that boost of self-esteem (sometimes I wonder if my kids really need it), it also helps promote innovation, creativity, problem-solving skills, and socializing! Recently, researches in this area have found a connection between the skills developed during arts and crafts time and success in later years of life. They concurred that toddlers and preschoolers develop what are called visual-processing skills when they create a crafty project. Visual-processing skills incorporate our ability to recognize patterns, find sequences in patterns, and identify spacial patterns. In simpler terms, if you have a blue triangle and you’re trying to fit it into a yellow, circular hole, you will be able to recognize that it doesn’t fit before even trying it. These same skills are what mathematics, geometry, and reading rely heavily on. Researchers also found that children who have regular arts and crafts time also have greater memory skills, muscle memory, and planned behavior. These skills are indicative of professional leadership skills (click here). Woohoo! Now let’s bust out some romantic crafts! I’ve divvied up these crafty ideas based on age for ease of perusing. Stir the salt and flour together in the mixing bowl. Gradually mix in the water until you have a nice, doughy consistency. Knead in the red food colouring until you have the desired colour and then roll the dough as if you were about to cut it into cookies (but don’t because they won’t taste very good!). Using your baby’s feet or hands, make a print in the dough. I liked making heart shapes with their feet and then cutting a heart shape around it. I also made a small hole at the top so that I could lace a string through to hang it up. After your unique baby creations are created, place the salty memories in the oven at 180 °C for about 10 minutes (times vary depending on the size and thickness of creations). Note: You can also paint and varnish your creations if you desire to make your own homemade toys! I drew a large heart on a white piece of cardstock with a black marker, added a bunch of glue to the inside of the perimeter, and provided my son with little pieces of coloured paper so that he could decorate as he saw fit. It worked very well – the third time. Haha! I mean to say he had fun each and every time he tried it but he mastered new skills along the way, making his third attempt worthy of carefully scraping it off the highchair to hang on the wall. First, measure your child’s head using the cardstock paper. Mark it with a pencil (don’t cut it while it’s near your child for risk of injury or a nasty haircut). Cut and tape it. Let your child decorate it with the hearts and pipe cleaner. I liked showing my son how to wrap pipe cleaner around his finger to give it a spirally appearance. We then put hearts on them and taped them to either side of the crown to appear as ears. For the necklace, holepunch or cut holes in the centres of the remaining hearts and let your child poke the other pipe cleaner pieces through them. Twist the pipe cleaner ends together so that they will make a lovely, romantic necklace with heart shaped jewels! My son is obsessed with bringing me flowers ever since he was allowed to pick them in my Mom’s garden this summer (she told me he was more accomplished at demolishing her flowers than the neighbourhood rabbits). This year, we made some DIY roses in a freshly decorated Chinese noodle box. They smell excellent. Help your child turn the cupcake liners inside out so that the coloured portion will end up being the inside of the roses. Stack three liners on top of one another and poke the pipe cleaner through the centre of the stack, so that it is just poking through, and twist slightly so that is remains in place. Do this for all six of the flowers. For the basket, tape the tissue paper to the outside to give it a beautiful glow. Place the floracraft inside the box and cover with more tissue paper. Then poke your pipe cleaner flowers into the floracraft. Viola! A beautiful centerpiece your guests are sure to comment on! Empty one half of the glue out of the bottle and add the black paint (the bottle should contain ½ white glue, ¼ black paint, and ¼ air), and mix well. Next, draw hearts onto the cardstock paper and let dry for one day. My son seemed to like when the hearts had many sections in them as it gave him more areas to paint with different colours. 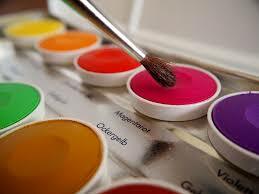 After the black glue is dry, let your child watercolour away! The watercolour paint doesn’t take nearly as long to dry (about half an hour). After we cut ours out, we taped them to his bedroom window so that it had a stained glass effect! I do hope you and your family have fun trying these artsy ideas! All of the materials were available at the dollar store, except for the floracraft, which was obtained from Michaels, and the Chinese noodle box, which was left over from lunch. They were all relatively well priced (even the lunch!) and many colour options were available. If you’d like more DIY craft ideas, I strongly suggest attending KARA’s Creative Play & More program, which is a free, drop-in program. KARA staff will surely astound you with the many crafty ideas they possess. Please come join us for an artsy day this week! With the New Year now in full swing, my Dad (Grandpa) approached me to engage in a strange conversation. That’s right. My Dad was looking to get into shape this year and he was counting on my high-spirited, active children to keep it fun and motivating! Kudos to him for coming up with this brilliant scheme, one that rivals the methods used by many gyms to get you into shape (and get your money). Surely this is going to benefit him, but would it have a positive impact on my kids? When I was young, we had a TV but exposure to it was limited by parental rules. If I wanted something to do, the number one go to for fun was activity (particularly outdoor activity). they’re exhausted, score the perfect goal when playing soccer, and jump on parents while they are sleeping. Gross motor skills are fantastic, right? And gross motor skills gained now last a lifetime, as does a healthy exercise routine. You may think that your kids get plenty of exercise right now by running, jumping, and just generally gallivanting around, which they do. But just like brushing their teeth, exercise will live with them if you start laying the foundation when they are small children. Promotes Heart Health: A heart is a muscle that works very hard during exercise. By doing your workout routine, especially cardio workouts, you are strengthening it. Clears Arteries: Keeping arteries clear and “teaching” them to expand and constrict lowers blood pressure. Increases Lung Capacity: By increasing the capacity for new air and enabling your lungs to efficiently move air in and out of your body, you are helping all of your cells get the oxygen they need to stay healthy. Increases Emotional Well-being: Exercise releases hormones that are associated with calmness and feelings of well-being while simultaneously reducing depression. To see more benefits of exercise, click here. 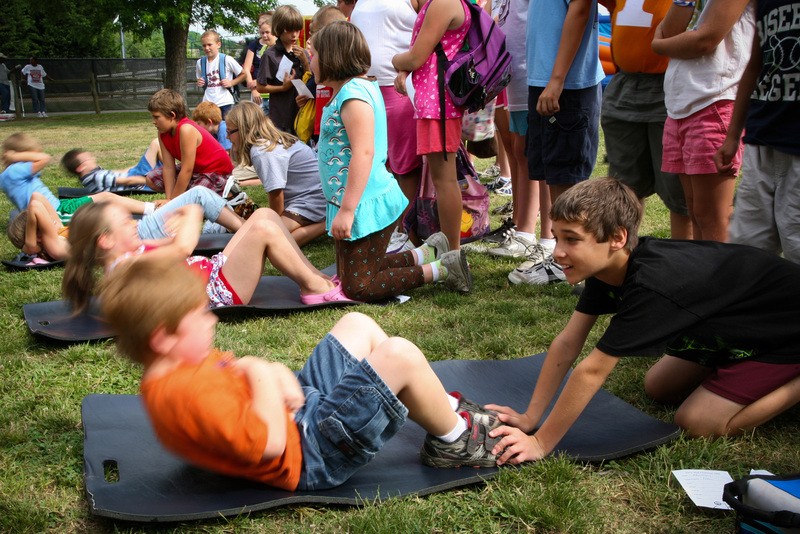 So exercise helps kids develop skills now and promotes a healthy routine that could last with them through life – Sign me up, right? But how do you start exercising with munchkins that can barely keep pace with you in the grocery store? Well we aren’t talking about lifting weights just yet. Start with these easy and fun exercises that are sure to increase the well-being of the entire family! My go-to exercises have always been ballet barre and yoga. Both are exceptional for strength building, improving posture, meditating, breathing control, and even relaxation. Additionally, the poses incorporated are both feasible and fun for kids and adults alike. Check them out, but be wary! Exercising correctly is more important than exercising at all. So, stretch first and don’t push yourself! Planking: In this yoga pose, lay down on your tummy, place your elbows on the floor, and raise your body up, straight as a board from your head to your heels. Hold the position for 10 seconds or more depending on your and your child’s ability. I like to do this one with my children five to ten times. Squats: Stand with your feet shoulder-width apart. Then bend your knees as if you are about to sit on a chair – don’t fool yourself too much because there won’t be one there to catch you! Holding this position is a bit tough the first few times but it really is a good one for strength building and balance! I like to do this one five to seven times with the kids. Rond de Jambe: This ballet move may be a hit with little girls (my boys like it too!). If you haven’t done this before, it’s nice to start with a chair to hold on to. Stand with your toes pointed out and both knees bent slightly. Raise one leg straight in front of you and your arm up in a curve over your head. For parents, be sure to rotate your foot so your inner ankle is engaged– this is what actually tones your leg muscles. Bring your leg back and then out to the side. Only go as high with your leg as is comfortable. This one is a bit too easy for my soccer stars so we go until they get bored. Plie Bend: Another ballet move that’s sure to be fun is the plie. Stand against a wall with your toes pointed out and slowly bend your legs so that you are sliding down the wall. Once you feel the stretch, hold for 5 seconds (or longer). Then slowly raise up to a demi pointe (not on the tips of the toes like true ballet, but on the forefoot). Like squats, I like to do this one five to seven times with my munchkins. Burpees: My sons’ favourite exercise because it is a lot of movement and gets your heart going! This sequence of movements starts you off in the squatting position. Then put your hands to the ground and kick your legs straight behind you so that you land on your toes. Now that you are in a push-up position, why not do one (ugh) and then jump back so that your feet land by your hands and finish by standing up. My kids think these are so fun that they never really stop doing them (I crash after 10). Try these exercises at home or come up with some of your own! I bet your kids will love them more than brushing their teeth (but please do still brush their teeth!). This week, I was a swashbuckling pirate with a peg leg, brandishing a foam sword while my scallywag preschooler danced around me with his own foam weapon in a fit of pretend fury. I deflected him numerous times before I gallantly admitted defeat, laid down my sword, and started changing my other child’s diaper. He is 3.5 years old. After laughing hysterically and trying to hold him at bay with one hand, I wondered, how did his amazing vocabulary evolve so quickly? At 11 months, my Grizzly Bear (preschooler now) uttered his first words. He was a late bloomer (in comparison to some babies) and said bye-bye to his grandpa as I carried him up to bed one night. He didn’t talk for months afterwards and said very few words when coaxed all the way until he was 2.5 years old. By 2.5 years, he could string together a few words but still seemed to lag behind his peers. As any parent would, I tracked as he met other milestones using the Ages and Stages Questionnaire provided by KARA (see Blog 14), and discussed speech milestones with his doctor. I was reassured that even though his speech milestones weren’t on par with others, he was within the normal range. At 10 months, my Polar Bear (toddler now) motioned up at me as he said “mama.” Of course, I was over the moon with joy at his choice in first-time speech, but his vocabulary didn’t evolve much from that beautiful moment. At 18 months of age, Polar Bear is still stuck on a handful of words, which he uses sparingly and with tremendous hesitation. I know he can talk, but he is quite stubborn and will whisper words to me and motion towards something rather than try. Of course, I am not concerned as the age range in which children learn to speak is particularly variable. By their first birthday, experts agree that a child should be able to say a handful of words, respond when you talk, and follow very simple directions (when in a good mood, I would imagine). My doctor indicated that if my kids could say one word by their first birthday, that counted and was within the normal range. I also understand that doctors are more interested in if a child responds to sounds and their parents’ voices rather than saying or repeating words. This form of communication (eye contact and body language) is a better indicator of being on track (click here for more info). By their second birthday, a child should use 50 words regularly; I recall trying to count all of my Grizzly Bear’s words at this stage and totalling in at 12 words. They should also be able to string together words; another area we weren’t excelling in. Lastly, they should be able to identify frequently used objects. Here was where both of my boys lived and thrived. They were quite capable of telling me exactly what they wanted – a book, a banana, a diaper change; they seemed to be communication experts when it got them what they needed. They also seemed to know what I was telling them – pick up the toy, put on the boot, lay down, etc. Conversationalists, they were not, but determined and clever, oh yes (click here). By their third birthday, a child should be able to speak clearly, speak in sentences, choose the correct words, and follow two-part requests. Check, check, check, check, and then some! Patience, practice, and motivation led my Grizzly Bear to becoming a conversational wizard! He derives new stories on his own, builds his vocabulary repertoire by himself, tries out new phrases, and even makes up his own jokes! Perhaps my son has moved on to being a teenager… I pondered as I turned up the radio. So what helped? Completing Ages and Stages Questionnaires certainly did because afterwards, I was able to talk to staff experts about activities I could do at home to help my children practice. I was given plenty of advice and tips after my Ages and Stages Questionnaires. One comment I even took away when my son was just an infant: apparently even a baby is interested in what I am doing or reading. A newborn baby can hear that I am making noise and can interact with me (through eye contact and listening), so why not tell them what I am doing or read what I am reading out loud? My sons didn’t have any inkling that I was spouting off what I was reading in the newspaper, but they were certainly happy to hear Mom’s voice! Next came self talk, where I would use short sentences to talk about what I was doing. My boys could pick up words, particularly nouns and verbs this way. Many children also learn action words like “bye-bye,” “want,” and “come,” which accompany actions like waving, pointing, or motioning. Experts suggest that while actively doing self talk and parallel talk with your children, it’s best to use short, simple sentences that are only slightly longer and more difficult than the sentences they are using themselves. This leads into expansions. Expansions – in this stage, after they use the word frequently, add a word to it so that it becomes a short sentence. Only expand on words and sentences that your child knows well and uses. It’s always a treat to hear your child learn something from you so try these and other methods to help your kids develop new language skills (click here). I also highly recommend taking an Ages and Stages Questionnaire or one or more of KARA’s literacy programs: Literacy and Parenting Skills, Aboriginal Literacy and Parenting Skills, Books for Babies, and Rhymes that Bind. The questionnaires and programs that KARA offers are wonderful ways to learn beneficial methods of promoting language development within a family. Give them a try!